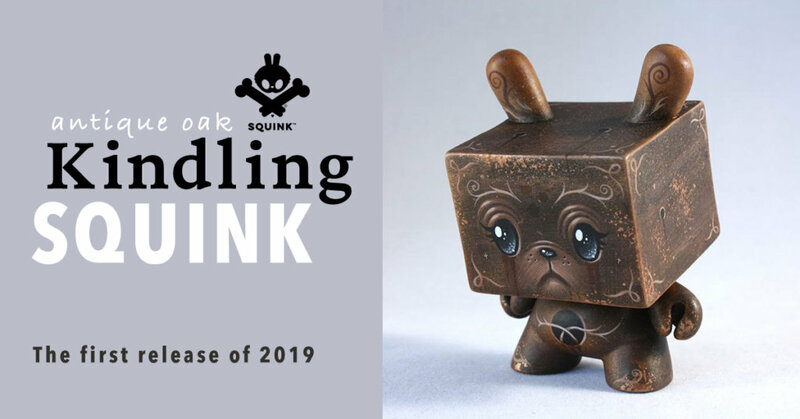 The first custom toy release of 2019 by Chris Squink! Meet ‘Kindling’, a custom square headed Devilrobots Dunny. Chris Squink never disappoints us. He has created a beautiful creature inspired by nature. Painted in antique oak colors combined with his well known delicate brush strokes. A 3 inch custom vinyl Kidrobot Dunny, lovingly hand painted in the studio using acrylic paint and inks (including metallic brass), with a clear coat for protection. Signed on the rear and as always the Dunny comes packed in a beautiful branded protective gift box. ‘Kindling’ will be available at his store on January 18th, tonight, at 8 pm GMT. (9 pm CET / 2pm CST / 12pm PST). Priced at £ 79.95. There is just one available so don’t miss it! Follow Squink on Instagram and Facebook.